sterling silver jewellery york fashion jewellery Aviv Sterling Silver Jewellery: Teardrop Earrings with Intricate Opal and Floral Detailing (E439) Sterling silver jewellery range of Fashion and Danon jewellery. From celebrated designer brand Aviv, Rue B presents this pair of beautiful teardrop earrings. Both earrings feature two sterling silver teardrop shapes inside of one another, and are intricately decorated with a tiny floral motif and incandescent blue opals. The earrings teardrop measure approximately 28mm by 15mm, with the opals measuring approximately 4mm. Aviv is a high fashion design jewellery brand, specialising in innovative sterling silver jewellery from all over the world. Each piece is lovingly handmade and is made of the highest quality silver. The stunning combination of silver with semi-precious stones creates a collection that is both contemporary and classic. Wear Aviv on its own for everyday effortless style, or combine pieces together for a truly unique statement look. All standard orders are delivered free of charge and jewellery comes packed in a suitable complimentary gift box. 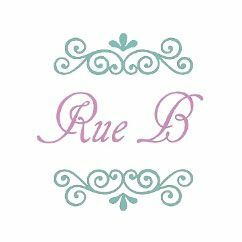 All jewellery from Rue B is hypoallergenic and 100% nickel free.